This year was my second year attending the Mesa-Phoenix marathon. 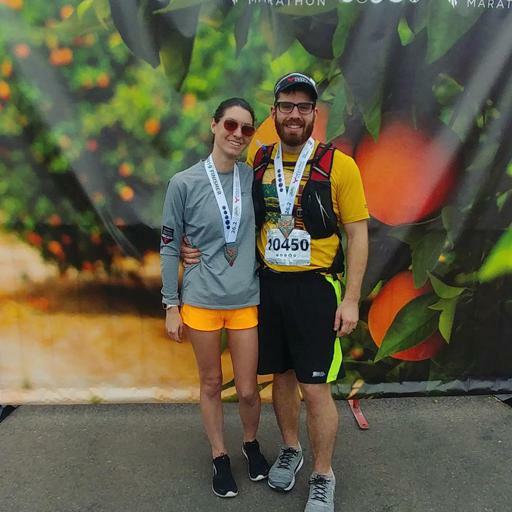 Trying to follow up on an impressive summer marathon's 11 minute PR would be difficult, and combined with my running since then, I was definitely feeling underconfident going into this race. In the summer I scored a huge marathon PR of 3:43 at the Super Marathon outside of Seattle in the Snoqualmie Pass area. The weather was perfect and the course was significantly downhill, moreso than Mesa-Phx. My training since this PR was decent up until September, when a lasting illness led to the tough call of sitting out the next marathon in the Cascade Super Series. I was sick through October and then went on my honeymoon, where I did a minimal amount of running. Fast forward to November's Seattle marathon. I had really wanted to cross it off the list since moving to the area, but coming in significantly undertrained, my time was far from impressive. This took me into December where I figured if I couldn't be quick I could at least work in a slow ultra and signed up for the Dreadmill 48 hour. My goal was 100 miles but I made the decision to stop at 70 after extended walking and creeping knee pain. From there I took a week off but got right back into long runs the following weekend. My long runs were slow and my recovery turn around was much slower than what is was when heading into my last marathon PR in June. 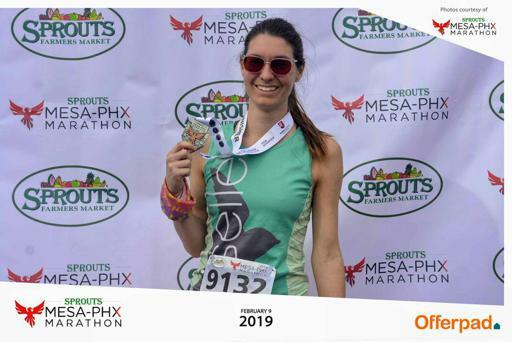 I became pretty discouraged and instead of working in a taper I kept running, completing two ~40 mile weekends leading up to the Phoenix marathon. Those training runs didn't raise my confidence much either. The week leading up to the marathon I debated whether to race the marathon or if I should take it slow and easy. 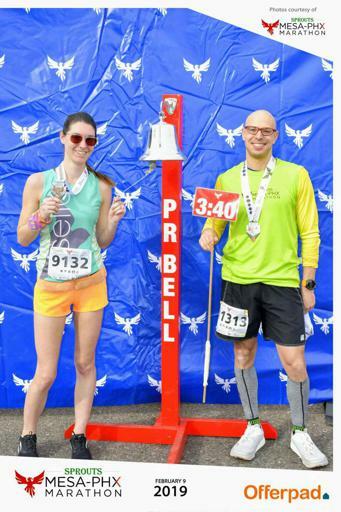 I debated everything from running with my husband for fun to trying to run a 4:00-4:10 goal marathon: far off from PR but seemingly more in line with where I believed my ability to be. Race day morning came and I was still debating, but ultimately decided to start within the 4:15 group. 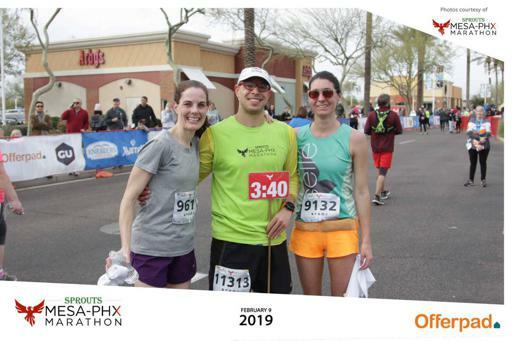 With what I knew from running the race last year, I stuck to the right side to avoid the dreaded reflective bumps that were in the middle of the road. With the race starting at 6:30am, it was hard to see them if you weren't paying attention. I started slow and settled in knowing it was steep early. My legs felt heavy from my lack of taper and I was nervous for the day ahead. I imagined myself blowing up at mile 16 and having to run/walk it in. I tried to focus on my breathing and not look at my watch. I clocked a couple miles and started looking at my splits - a little fast. I made an effort to slow down, especially on the uphill section about miles 4-6. I passed the 3:50 pacer before the uphill section, but they caught me briefly on the long hill. I figured, although I was back ahead of them and taking advantage of the downhill, it was possible I may see them the second half of the race. I took this risk, knowing full-well it could backfire on me. For the next few miles I mentally checked out as I thought about what was ahead and was surprised by how much of the course I had memorized from running the race the previous year. Around mile 8-9 you run across an aid station which I remembered being the most enthusiastic aid station with signs that stretched seemingly forever. Some of the signs I recognized from the previous year while others seemed new. Before I knew it I was at mile 12 and saw a red pacer sign in the distance. On the approach, I realized it was not a 3:45 pace sign but rather the 3:40. There was no 3:45 pace group. I realized that this meant up until this point I had been running faster than my previous marathon PR pace which was scary considering how I felt my training had gone. I made a mental note to slow down and stick with this pace group for at least several miles knowing that I still had over half the race left. I also knew that since I had started so far back, my chip time was currently faster than a 3:40 pace. I clocked more miles. The course slowly flattened out which made the pace feel slightly harder. My leg were sore and I knew that if I were to start walking at this point they wouldn't want to start up again. I worried about dropping the pace group knowing the only thing that was motivating me was trying to keep up with the group. Mile 21 came and went and I felt great. I had a bit of pain from chafing in my underarms but when I kept passing aid stations I'd either miss the area that had Vaseline or it was far back behind the cups of gatorade and water. I didn't want to lose the pace group picking any up so I continued (which made for a rough couple of days following the race). Then about mile 22 it happened. My body started falling apart and the pace felt HARD. I worried with over 4 miles left I may not PR after all. I went deep into my survival mode trying to think of anything but the marathon I was running in and focusing on staying with the pacer. My feelings of discomfort grew as I began to feel lightheaded. I didn't want to alarm anyone, but I also felt like I could pass out at any moment. The day wasn't hot, I had stayed on top of my nutrition and had taken in plenty of fluids. I took more fluids and ate some more at the next aid station but the feeling didn't pass. I was running at my limit, but my pace was dropping. The group began to sneak away from me with ~2 miles to go. I felt defeated but focused on keeping pace with another small group of brisk-looking runners. They motivated me but it wasn't long before I couldn't keep up with them either. When they started to creep away I was bummed and without thinking began to walk. They turned around and encouraged me while another runner came up from behind and gave me a light tap on the back telling me to keep going and that we were almost there. I started crying a bit as I was still feeling dizzy but thanked all the runners for looking out for me. I made an effort to run it into the finish even though I was slowing down signficantly at this point. I was giving it all my body would allow me to give. I suddenly realized that although the 3:40 pace group had passed me, I could still see them and focused on trying to keep them in my sight. I knew if I did that I still had a chance of finishing around 3:40 - or at least beating my 3:43 PR. As I got closer to the finish I wanted to speed up and be done, but my legs weren't turning over. I gave it all I had and coming across the finish line I was surprised to see the gun time at 3:40 and change, meaning that I had likely beat 3:40. I stopped my watch to see 3:38:18. I was crying and thought I might pass out all at the same time. 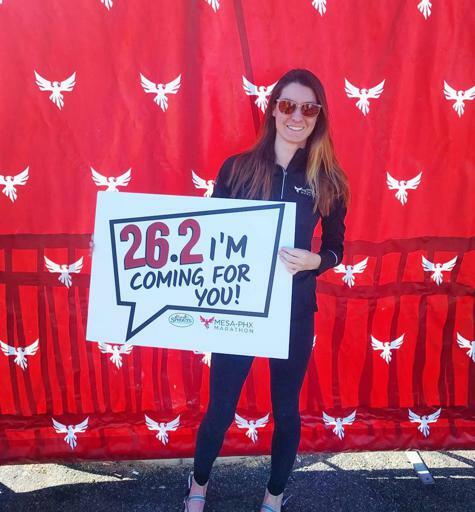 I thanked the pacer and runners who had motivated me when I briefly fell apart. A few days later, I am still in awe at my PR of 5 minutes. I continued to put in the training in even when it felt like it wasn't good enough and ran with my heart even when it didn't feel like it would be enough. You can BET that I'll be back next year. I'm even considering getting in on the 2016 and 2017 virtual races this year so I can finish off the C's next year.